Now days, the corporate is quite mesmerized about investing in the maintenance of the office. This is the essentiality of corporate growth. Corporate working lifestyle requires modernized and designer furniture with perfect appearance. The modern furniture efficiently helps in integrating the productivity of office and its growth. 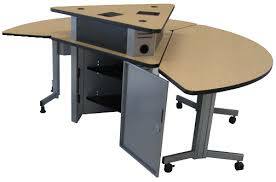 The high tech office furniture environment develops cost usefulness; improve the productivity and morale of the employees and building customer relations. Conference room can be a perfect place to integrate the technology for furniture in order to impress the customers/clients and maximize the productivity. In order to maximize the opportunities to do so, you have to employ technology bound furniture at the place. The perfect conference room furniture installs advanced monitors, projectors, phones and some other video conferencing equipments. An economical idea to save some amount of your investment can be to renovate the used table with some experts so that it looks like the advanced designer ones. Many stores in the market provide this facility, the only thing you have to do is to approach the stores and select the advanced design which suits your office. Most of the times, this section is left untouched when it comes to modernizing the office. It is significant place to with an opportunity to integrate the area with latest and advanced well furnished pieces. This space provides the first impression at your guest, customers, clients and employees also to certain extent. You must employ some task or luxury comfort chairs from integrated technology furniture for the guests at the waiting areas along with some small tables garnished with some digitally designed to impress the guests with modern style and art. Hanging up an LCD for entertaining the guests could be a great idea. It is ideal to place the chairs and tables at some distance from the wall as it will provide some spacious appearance to your room. Playing simple and quiet music is a perfect and economical method to entertain your guests. This is how you can decorate the reception area with some modernized techniques. Wiring and cables are the major factors which provide some weird look to your office. In fact it seems to employ most of the space at the desks of the employees. Hiding the wires and the cables will be great approach to modernize the office. You can plan and incorporate some electrical outlets for hiding the wires behind the technological outlets. The most adoptable approach to promote space planning. Various stores provide technological experts to help you in space planning. These trained experts install all the wiring system as per the designs and décor of the office. Your nearest furniture stores are the best one you to assist you with Integrated Conference room designer furniture, reception area furniture and other material expert advice required to furnish the office beautifully. So start looking around for these stores today.